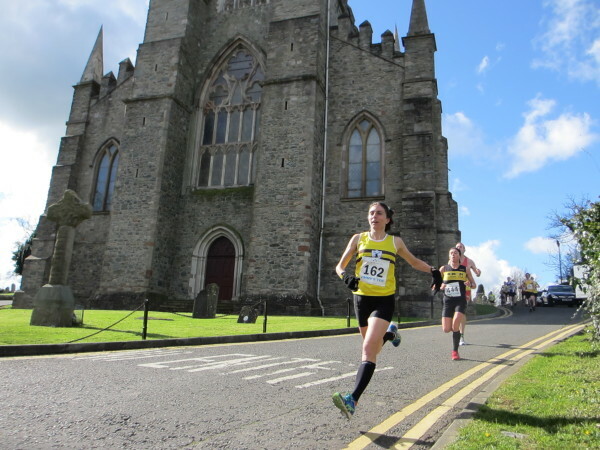 Down East native Gladys Ganiel runs past St. Patrick's Church in Downpatrick, Northern Ireland, on her way to winning the Jimmy's 10K Road Race in March. Gladys Ganiel’s bid to represent Ireland in the 2016 Summer Olympics apparently has come up just short. The 39-year-old graduate of Narraguagus High School in Harrington, who now works as a research fellow at the Senator George J. Mitchell Institute for Global Peace, Security and Justice at Queen’s University in Belfast, Northern Ireland, has been selected as the first alternate to the Irish women’s marathon team that will compete in the 31st Summer Games to be held in August in Rio de Janeiro, Brazil. Three women with faster qualifying times than Ganiel, Lizzie Lee (2:32:51), Fionnuala McCormack (2:33:15) and Breege Connolly (2:37:29), were named to the Irish team this week by the five–person Athletics Ireland selection panel, according to the Irish Times. As first alternate, Ganiel could become eligible to replace one of the three team members should any of them be forced to drop out because of injury, the Times reported. There had been some thought that Ganiel, who ran the fourth-fastest qualifying time among Irish runners of 2 hours, 38 minutes and 47 seconds at Seville, Spain, in February — just nine months after she and her husband, Brian O’Neill, became parents to their son, Ronan — might be able to secure one of the three Olympic team berths. McCormack also had achieved the Olympic qualifying time for the 10,000-meter run, “but has let them select her for the marathon, so presumably she is not changing her mind now,” said Ganiel in an email Tuesday. In addition, the qualifying time run by Connolly — a teammate of Ganiel with the North Belfast Harriers running club — is more than a year old, and there was some question as to how that would be received by the selection panel. Ganiel ran the Leiden Half Marathon in the Netherlands on Sunday in an effort to show the Athletics Ireland officials that she had recovered sufficiently from her February marathon, but while she won the race her time of 78:28 in what the Irish Times described as “difficult conditions,” it did not convince the selection panel to move her up to one of the three Olympic team berths. The Leiden race also came not long after the death of Ganiel’s mother, Jennie, in Harrington on May 13 at age 73. “The week leading into the race was not normal for me,” said Ganiel. “She had been ill so we had been expecting it, but I know I went into the race feeling a bit drained. Ganiel, a dual U.S.-Irish citizen who was a distance running standout at both Narraguagus and Providence (Rhode Island) College, will not be without an international race to compete in this summer. She has been selected to represent Ireland in the European half-marathon championships on July 10 in Amsterdam, the Netherlands.